Big Box Storage of Oceanside, CA provides portable storage services to residents and businesses throughout Oceanside and all of north San Diego County, including Camp Pendleton. The company provides its customers with the ability to meet their self-storage needs without ever having to leave home. Forget the hassle of renting, loading, driving, and unloading a truck: Big Box Storage will deliver any number of 8' x 5' x 7' storage units ("Big Boxes") right to the exterior of your home in or near Oceanside, California including zip codes 92054, 92056, 92057 and 92058. Load the Big Boxes at your leisure and lock them once completed. 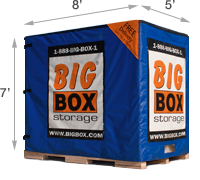 Your Big Box(es) will then be picked up and transported to one of the company's secure, indoor storage facilities. 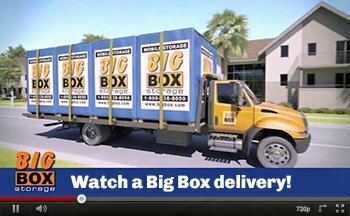 Whether you live in Oceanside or almost anywhere else in San Diego County, Big Box Storage offers service directly to and from your door. The company also offers services across North County including storage in Carlsbad as well as storage in San Marcos. Each Big Box is 8' long, 5' wide and 7' high, and can typically hold the storage contents of up to a room and a half. If you should need more storage space, multiple Big Boxes can be delivered to your Oceanside, CA address. Please feel free to utilize the storage space estimator for assistance with the number of Big Boxes you might need. Once your Big Box is placed into storage, you'll be able to access it any day of the week by either visiting the company’s secure storage facility or having the Big Box storage unit delivered back to you. Of course, once you no longer need the storage space, the company can deliver the Big Box(es) to your home or business, even if you have moved – whether your new address is still in Oceanside or if you’ve moved across the country. You'll also be pleasantly surprised to learn that the company's portable storage services aren't just convenient; they're also very economical. The low monthly storage rental rates are backed up by the company's best price guarantee. Furthermore, Big Box Storage of Oceanside also offers free delivery and pickup (with a min. storage term) throughout Oceanside and other San Diego County communities. Please feel free to check current pricing by clicking here. Should you have any questions or comments, or should you wish to schedule a self-storage delivery to your Oceanside home or business, please contact a helpful representative at 760-453-0710.